Pakistan Cyber Force: Is Wal-Mart behind Bangladesh Factory Fire? Wal-Mart Stores Inc. (WMT), the world’s largest retailer, fired a supplier that made apparel at a Bangladesh factory where more than 100 people died in the country’s deadliest ever blaze at a garment facility. However critics believe that this is a cover-up and Wal-Mart is trying to whitewash its dirt. “The Tazreen factory was no longer authorized to produce merchandise for Walmart,” Kevin Gardner, a Walmart spokesman, said in an e-mailed statement. “A supplier subcontracted work to this factory without authorization and in direct violation of our policies. Today, we have terminated the relationship with that supplier.” He declined to name the supplier. The factory, owned by Tazreen Fashion Ltd., had no emergency exits, and many workers were burnt alive, as they got trapped in heavy smoke, said Muhammad Mahboob, a director at the Fire Service and Civil Defence. Some workers jumped from the eight-story building to escape the flames, according to Mohammad Sharif, who runs a local grocery store and whose parents-in-law worked at the plant. At least 124 people were killed in the fire on Nov. 24, said Habibur Rahman, superintendent of police for Dhaka. Shafiul Islam Mohiuddin, president of the Bangladesh Garment Manufacturers and Exporters Association, estimates the death toll at 113. Textiles contribute more than 10 percent of Bangladesh’s gross domestic product and about 80 percent of the nation’s exports, mainly to the U.S. and the EU, according to the manufacturers’ association. 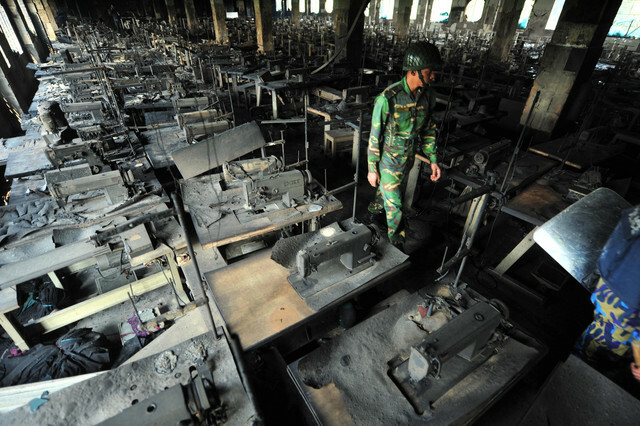 Bangladesh’s High Court yesterday opened a probe into the nation’s worst garment factory fire. After four human rights organizations filed a writ petition, two judges in a ruling asked the government to explain what steps it has taken to implement an earlier High Court directive to ensure the safety of garment workers. About 700 apparel industry workers have died since 2005 because of unsafe buildings in the Asian country, the International Labor Rights Forum said in a statement. The second deadliest fire was in 2006 when 54 people died at KTS Textile and Garments in the port city of Chittagong, according to the manufacturers’ association. As wages have risen in China, companies such as Li & Fung Ltd., the world’s largest supplier of clothes and toys to retailers, are tapping Bangladesh and other lower-cost Asian countries. The factory that burned down has produced apparel for Li & Fung (494), which has said it is in contact with the factory’s owner and that it will conduct its own investigation. The fire won’t have any material impact on the company’s financial performance and the total value of orders placed by its U.S. subsidiary for the year amounted to $111,000, Li & Fung said yesterday. It hasn’t placed orders for other customers with Tazreen, it said. Wal-Mart has visited supplier factories to identify those deemed “high risk for fire safety hazards,” it said on its website. In 2011, the company stopped working with 49 factories in Bangladesh due to fire safety issues, it said. Tazreen Fashion, a unit of textile manufacturer Tuba Group, employs 1,200 workers and exports goods worth $36 million a year, mainly to the U.S. and Europe, according to the company’s website.